Ten years ago, on the eve of the last open presidential contest in 2008, the Metropolitan Policy Program convened leaders from the Great Lakes to discuss the region’s unique economic and social history, and push for economic answers. A group of us then worked to develop and implement a roadmap for economic revival, under the banner of the Great Lakes Economic Initiative. As a result, expanded federal investment in energy, manufacturing, and health care innovation was channeled to the region’s world-class universities and their business partners while billions of dollars in funds for Great Lakes clean-up began to flow in recognition of the economic development power centered around clean water and rehabilitated waterfronts. In addition, new public-private investment partnerships were built to finance infrastructure projects, and overcome deficits in venture capital to ensure the region’s prodigious technology invention led to new business growth. The election of Donald Trump in 2016—keyed by these same states—has focused national attention on our region and the state of Michigan like never before. As our 2006 report “The Vital Center” detailed, there is a unique economic, social and cultural storyline to the region. 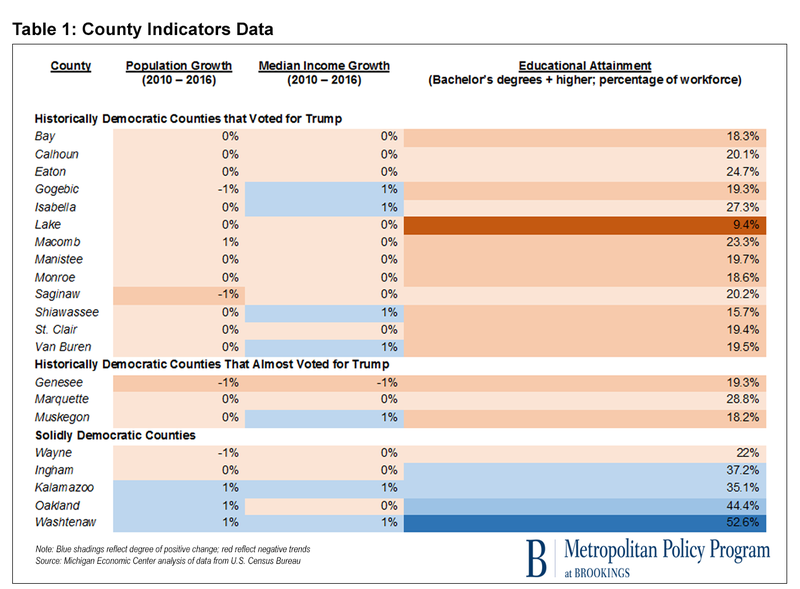 But here’s the thing: while one part of that storyline helps explain why the Midwestern electorate was moved to turn out and vote for Donald Trump, another part points to different outcomes. The cradle of America’s great industrial economy, the region has borne inventions such as the automobile and the assembly-line manufacturing process courtesy of Henry Ford. Industrial cities like Detroit boomed across the upper Midwest, and spurred the growth of an interdependent network of small and medium-sized factory towns sprinkled liberally amidst the region’s cornfields and forests. A highly integrated supply chain grew, making everything from cars to chemicals, dishwashers to tooling dyes, cereal and steel. Industry advancement stretched from Minnesota and Iowa in the West, across the Great Lakes through western New York, and into Pennsylvania and the “Chemical Valley” and coalfields of West Virginia in the East. But when new global competitors, technological change and automation led to dramatic restructuring of the region’s heavy industry, it obliterated a huge number of good-paying assembly line jobs, and shuttered employers in the Rust Belt’s company towns. In so many once-thriving communities, young people have fled, and the residents who do remain have grown frustrated over diminished job prospects, and are anxious about the future. The very same anger and anxiety that found an outlet at the ballot box in 2016. In so many once-thriving communities, young people have fled, and the residents who do remain have grown frustrated over diminished job prospects, and are anxious about the future. The very same anger and anxiety that found an outlet at the ballot box in 2016. And these communities all voted “blue” last fall. It’s a very different story in many other Rust Belt communities, however. The small- and medium-sized factory towns that dot the highways and byways of Michigan, Indiana, Ohio and Wisconsin have lost their anchor employers and are struggling to fill the void. Many of these communities, including once solidly Democratic-voting, union-heavy, blue collar strongholds, flipped to Trump in 2016. Many of these communities, including once solidly Democratic-voting, union-heavy, blue collar strongholds, flipped to Trump in 2016. Let’s provide an illustration with examples from my home state of Michigan, where Trump won an astounding 75 of 83 counties overall, but only won the state as a whole by a scant 10,000 votes out of over four million cast. Twelve Michigan Counties that had been reliably blue turned red for Trump in 2016. Among these flipped counties includes historic Democratic strongholds like Bay and Saginaw counties on the I-75 auto plant corridor; Monroe county in the heavily industrialized (and unionized) “Downriver” area south of Detroit; and Calhoun county, home of “Cereal Town” Battle Creek. All of these counties and others flipped to Trump in 2016. And for that matter, Trump almost carried several other blue-collar Democratic strongholds. Democrats squeaked out very narrow margins in Genesee County (home of Flint), Muskegon and Marquette counties. A common denominator in all these communities are trends of population, income loss, and lower education levels—adding up to residents feeling more at sea in today’s economy. Once solidly Republican Oakland County, which surprisingly also went blue. Oakland is home to a well-heeled professional class, a growing middle-class African-American and professional immigrant community, high education levels, and a very diverse economic base. These communities are growing in population and income, and are attracting and keeping well-educated people. In other words, they are “Rust-Belt” no more. You will find this same pattern in the other Rust Belt states. In each of them, there are a number of bigger, more economically-diverse metros; college and university towns; and communities with special history, culture, or geography to leverage (spectacular waterfronts are one)—that thrive. By contrast, many more Rust Belt communities are shrinking, aging, and anxious. This story of two Rust Belts, and the economic opportunities and challenges that face the region, are now newly and dramatically exposed to a broader audience. They raise big questions: how do our states and the nation help residents of once-thriving “company” towns find a new place in the economy of today and tomorrow? How do they adapt to change? Can they secure a measure of economic security in the process? But they also ask us: what can we learn from those Rust Belt communities, like Pittsburgh and Kalamazoo, which have survived the collapse of the factory economy and gained a new kind of economic success? These issues will be examined in future posts, and future work. John Austin is Director of the Michigan Economic Center. As a nonresident senior fellow, Austin created and directed the Brookings Great Lakes Economic Initiative.